November's victories at the ballot box show the drug war is vulnerable. Eugene Jarecki is an author and a filmmaker, the director of Freakanomics, The Trials of Harry Kissinger, Why We Fight and, most recently, The House I Live In. The House I Live In, his documentary about the drug war, leaves one thinking that nothing will ever change, but recently something did. On election night voters in Colorado and Washington State voted to legalize recreational marijuana and voters in California passed a ballot initiative to end that state’s controversial mandatory minimum law, “three strikes and you’re out.” Jarecki sees possibility for more change to come but danger in imagining small victories will win the war-against-the-war. Laura Flanders: The day after the election what stuck out to you? What did you wake up feeling? Good mood? Bad mood? Eugene Jarecki: It was with a guarded kind of optimism, but optimism nonetheless. On one level you look at the presidential election: the re-election of Barack Obama is far more significant than his original election…. The American people by a majority are saying we’ve seen this guy on the job in very hard times, we’ve watched him go gray on the job, and frankly seeing his performance we think he would simply do a better job than the other guy, the other white, patrician, wealthy guy, and that’s an important moment in American life in terms of race; there’s no way around that whatever one thinks of Barack Obama (and I have been quite a critic of Barack Obama), that’s a victory and it’s an important victory for our evolution in race, but of course it also revealed another half of the country feels actually not very progressed in terms of race. A lot of the antagonism towards Obama is expressed in rather thinly veiled old notions of how to involve in race speak in American life. So that was a little disorienting, so I will call that bittersweet. But against that backdrop there were great positives on Election Day that didn’t have to do with the presidential election, and I allude here to the victories in the state of Washington, the state of Colorado and the state of California. In Washington and Colorado we saw legalization of marijuana. As a maker of a movie about the drug war, that’s very important to me, because I think those victories demonstrate a certain frailty in the system and they demonstrate a public appetite for going about this differently, for starting to recognize that the way we’ve dealt with drugs over the past forty years has been a disaster and that we need a course correction. In the state of California the victory was almost more significant because Californians as it turns out voted 68 percent to revise the notorious three-strikes law in California. Prior to election day the three-strikes law in California could put you in jail for the rest of your life for a third offense that was petty or nonviolent—as trivial as stealing a slice of pizza or stealing dental cream or socks, as one person got a life sentence for. When you see such an absurd law as that finally get addressed by the public who voted to say, henceforth under what was called Prop 36, California law has now been changed. Now the third strike that puts you in jail for life has to be serious or violent. That’s what we should think would put you in jail for life, but that hadn’t been the case for decades and now it is the case. I think that sends a message across the nation, not only in California (which led the nation into draconian sentencing), that they can begin to lead us out toward a more sane place. But for anyone who doesn’t care about the humanity of it, this will save the state over $100 million dollars a year, and I want to send that message to other state governments who are hemorrhaging money and themselves have excessive sentencing policies in the drug war. 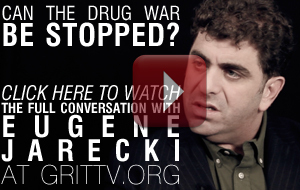 How did the US come to spend a trillion dollars on a so-called “war on drugs”? I can’t underscore just how disastrous the drug war has been. We’ve been at this for forty years, it’s our longest war, we’ve spent a trillion dollars, we’ve had 45 million drug arrests and what do we have to show for it, a record of abject failure. Drugs are cheaper, purer, more available than ever before. We have the world’s largest prison population in real numbers, 2.3 million people behind bars, and of course more of our citizens behind bars than any other nation as well. So we look at the numbers and they speak of such a tragic error and misguided policy that the question is, How long will it take until it dawns on our policy makers what I think the American people increasingly know which is that this is a gigantic waste of money and time, where we can’t afford a waste of money, and it is denigrating a cross section of our population, particularity minorities, particularly poor people, particularly people of color, and has been doing so for decades to the incredible detriment of that community, and the detriment of ourselves and our standing in the world. In your film you show how we got here; the private interests of corporations and the public interests of politicians were both drivers. Given the popularity of getting “tough on crime” and the self-perpetuating nature of this criminalization of a whole section of a population…. What happened? I mean with that kind of machine pushing in one direction how did voters in California, Colorado, Washington say “stop”? To sort of put this in five easy pieces we can look at the drug war in the following way, we’ve had drug laws going back in this country to the 1800s. The first drug laws we saw were opium laws that were, lo and behold, targeted towards Chinese immigrant populations coming to America. In a way that we saw that these were thinly veiled laws of racial control. We made opium illegal, but only in California, and only the way Chinese people were taking it, which was to smoke it. Everywhere else in the country it was legal. So we were very selective with our opium laws and we used it to harass and incarcerate Chinese immigrants. That gave way to a new chapter in the Mexicanization of hemp, which was suddenly renamed “marijuana” so that we could use it as what we called “Mexican Opium” to stop and detain Mexicans in new and startling numbers. Chapter by chapter we’ve seen drug laws in the history of this country really be thinly veiled laws of racial control. It wasn’t until 1971 that this was declared a “war.” Richard Nixon stood in front of the American people and declared a war on drugs. When he did that he unleashed the dogs of war. What had been an ad hoc series of improvised laws over time suddenly got codified into a national policy, and a national policy on a wartime footing. What does a wartime footing imply? It implies all of the horrors of war: the incredible casualties, the mass scale and the entrenched economic and bureaucratic interests that arise that sense of a threat. The moment you could now say this is not just a little group here or there, but this is public enemy number-one, as Richard Nixon called drug abuse. Well, you can’t declare a war on a substance like drugs anymore than you can declare war on terror. The war on terror was a war on people we associate with terrorist activities. The war on drugs was a war on people we associate as being involved with drugs. That ended up being a very specific, a very racially targeted and ultimately economically targeted cross section of our population. How does this machine gather the critical mass that it has gathered to basically continue in spite of its record of incredible failure? That’s where it really becomes clear that it is an unholy alliance between the corporate sector who prey upon our fellow citizens for profit because they need a flood of bodies coming through the system that they need to feed, house, provide phone service, provide meals for, provide all of that kind of thing. There’s a profiteering engine on the backs of people. Then of course they need the help of those in Congress that make the laws that create the flood of bodies. You have in Congress people who basically work for those corporate interests and they tell the public scary things that are meant to make us vote for “tough-on-crime” laws. Those tough-on-crime laws are really just ways of ensuring that a flood of bodies keeps flowing through the system: we have tougher and tougher laws, and they keep people in for longer and longer, for less and less violent and less and less serious crimes. So let’s go back to my question of what changed. We have rising competition over living wages and quality jobs; we have increased racial anxiety as the demographics of this country change. Politicians are the same old bunch. What changed that these ballot initiatives got passed? Well, I think more and more Americans are either drug users or familiar with a drug user. How many of us know somebody who is an addict? Is our natural response when a friend comes to us in a relapse, or “I’m hooked on this substance or that,” is the first thing we do is to call the police? It’s just not common sense. It’s not what any of us would do. We would try to find a soft landing for the person, a medical person, or a help group or an anonymous group or something. We would actually try to find something that helps the person on that path forward. None of us, with what we now know about addiction (which is now more than we knew forty years ago) would see that’s the right way to do it. The trail of failure, the economic disaster from it, and our own sense that we’ve come of age and it doesn’t make sense as public policy, that’s all coming together. The victories in Colorado, Washington and California all demonstrate that the public is shifting in their sense of this as a priority. I hope they are shifting to remember that drug abuse is an always was a health matter, a personal health matter and perhaps a public health matter. It was never a matter for criminal justice. It was never appropriate for someone who has an addiction to send them into the arms of a police officer when they should have been sent into the arms of a doctor, or a healthcare professional. We should be clear that voters in Colorado and Washington state voted to regulate recreational marijuana in the same way that alcohol is regulated, not to lift all laws entirely. What happens next and what happens next in the struggle of California around mandatory minimums and sentencing? I think these are small victories, and I think we have to be very careful not to let small victories woo us into any sense of false comfort. We need a revolution in the war on drugs. We need to absolutely throw this thing out, relegate it to the ash heap of history and start again with real information about what drugs really do, about how they affect human health and about what to be afraid of and what not and how to treat people. We need a revolution, but when you want a revolution it’s sort of like a pot of water on a stove with a cover, it starts to boil. It really needs to boil and at a certain point it needs to blow up in order for the real meaning of change to take hold. A small victory like this doesn’t’ do that, but it does show that the system is vulnerable. The danger of course is each time you have a small victory it’s as if you let a little bit of steam out of the pot and all that means is that you delay the moment of explosion and you delay the moment of a serious overhaul because people tend to think that drug war, didn’t that get fixed in Colorado and Washington? I think that’s fine, we’re on the road to recovery. Americans are busy, we’re overworked already so we’re just looking at a way to put any issue out of our mind. They keep stacking them up. Every time we turn around there’s a new part of our society that’s really calling out for attention as a dire situation. So we want to be able to go back to sleep, but we can’t go back to sleep. This is only the beginning, and people have to recognize that these victories show some vulnerability and indicate how important it is to continue the fight to end the drug war. Why do you feel so strongly about this, and who in your movie surprised you most? I grew up in a time in America, in the wake of the civil rights movement where for a lot of young people like me who came out of a Jewish Holocaust past—my parents fled Nazi Germany on one side and the czars of Russia on the other. They came to America and they taught the boys in my family—we’re all boys—they taught us that our lives would only make sense if they were devoted to social justice here in America as we had not enjoyed it in Europe, and that we were supposed to be messengers about the kind of suffering that we and others endured. My life has been really a story of trying to live up to that legacy, and try to be a messenger about the dangers to democracy that can arise in societies, and dangers to human dignity. So I’m driven by something that goes way back in myself. In terms of the American experience I then grew up in the wake of the civil rights movement where I watched the promise of the movement in many ways not take hold. The young African-Americans all around me when I was growing up , I thought we were all in the same footing; I thought it would turn out the same way for all of us. I found myself very blessed finding opportunities in my life that were terrific and inspiring and a world of possibilities, and I found that they weren’t [having the same experience]. They were finding obstacle after obstacle that included tremendous brushes with the criminal justice system and a very disproportionate set of laws and approaches by law enforcement. And I began to see that in the system of mass incarceration that was overtaking the Black community, what Michelle Alexander recently called in her book the “new Jim Crow.” I saw a new Jim Crow emerging in my own way, and I wanted to do something about it. I went across the country to about twenty-five states and talked to people at all levels of the system from the drug dealer, to the drug user, from the family member to the community, to the cop, the judge, the warden; everybody up and down the sort of family tree of those involved in the drug war. What I found is that everybody is a victim. I thought I was going to find winners and losers, heroes and villains, that kind of black-and-white stuff that movies are made of. It made it harder to make the movie because any time I found anybody it turned out they had a deep story with the war on drugs, even if they were a jailer, or a warden or a cop. They weren’t immune from the broad brush that this war on drugs has painted. It has hurt their lives, it has degraded what they do for a living. It has often hurt their own family members who are on the other side of—on the receiving end of the law. By and large I found that they were all calling out for reform. Amazingly, inside the system there is this human majesty where people—you know a cop—would tell me from the front seat of his patrol car “I don’t agree with what I am doing, I am arresting the same people day in day out, week in week out, this isn’t working. “ Then I would get inside the courtroom and the judge would tell me from his bench –he would cry out for saner sentencing laws because Congress is passing mandatory minimum laws that take away the discretion of a judge. We think judges make the decision, they don’t. In the majority of cases the judges have a prescribed sentence that he/she has to give that basically is a rubber stamper with his/her hands tied. Of course then I would go into the prisons themselves and find security chief Mike Carpenter, who is a fellow inside a prison in Oklahoma, an amazingly thoughtful, deep thinking person who I first thought was a caveman, and it took sitting down with him to discover that no, this guy has a deep appreciation of what he’s doing and of what’s wrong with the system that he’s functioning in. All of these voices inspired me enormously because they say to me that if people inside the system can take the tremendously courageous step of coming from the place where their very job and livelihood itself is vulnerable, of speaking out and asking for reform, then for the rest of us it should be our daily work to pursue such reform because that is such an example for us to follow. If people want to get involved what can they do? Well, I encourage people to go to our website thehouseilivein.org, where we have tried to put together a kind of a portal that you can enter, you can enter your zip code and by entering your zip code you can learn a great deal about what’s happening where in the country, say, your state New York. Then it will tell you what are all of the issues in the drug war in this state. One of the big ones here is stop and frisk that police are stopping and frisking hundreds of thousands of people each year, an incredible violation of the Fourth Amendment, tremendous scourge on New York. So you can learn about that –who is fighting against it and what you can do. You can write your congressman. There’s a lot of clickables there that let you get involved in that sort of mouse-click revolution that everybody wants. At the end of the day everybody is a voter, at the end of the day you literally have to pursue change with your body, with your mind, with your feet, and with your vote, and there’s no other way. From now on what I would like people to take away most is whatever piece of legislation is coming at them in one election or another, whether local, state or federal they have to develop a tin ear to tough-on-crime rhetoric. Politicians have fed us tough-on-crime rhetoric for decades ever since Richard Nixon coined it. What it does it says vote for me and I will protect you from your neighbor, and it is fear-mongering of the worst kind, and it had led to this $1 trillion disaster. So people need to now, henceforth, when a politician comes to you and tries to work you up about what a danger your neighbor is, understand that they’re advocating something far more dangerous, which is the drug war which has been incredibly terrible example of man’s inhumanity to man. So I would say people demand of their politicians that they come back and when they’re ready to be smart on crime, and until them boo and hiss them until they stop talking that way. Finally, Eugene, you have a huge body of work. We’ve talked about a lot of it. A film on Reagan, Freakonomics, Why We Fight, is there a connecting link? Sure, I am very frightened by the impact of modern capitalism on American democracy. I think that capitalism is destroying democracy in this country because we drank a Kool-Aid under Reagan of a kind of runaway, not mom-and-pop capitalism. We love the idea of entrepreneurs and pioneers who start their little store and make a success of it. Modern capitalism is something else. This is the idea of free market as promoted by people who want anything but a free market, what they want to do is monopolize the free market so mom and pop can’t compete and ultimately go out of business and get replaced by a box store. So that’s the America that I fear because it’s in an America where, you can go into Burger King and you can have it your way and you can design your little burger the way you want to with pickles or mustard, your choice, but Americans don’t realize by entering the Burger King to begin with, a Burger King that’s able to curry incredible favor with your politicians that you can’t. A Burger King that could pollute your water supply and you couldn’t stop them. A Burger King that engage in shady labor practices and you don’t have the power. All of those things that those major corporations are doing, you’ve given away your actual choice already by letting Citizens United and other decisions in this country let loose the dogs of capitalism on the American body politic. I think that is a theme common to all of my films. I made a film about the military-industrial complex, and how it threw us into war whether we wanted to or not. The majority of the American people are peace seeking and yet we find ourselves in war after war. The American drug war which has [been] perpetuated despite every evidence of its failure by a system of industrialized for-profit incarceration. So many businesses, so many jobs, so many bureaucrats relying upon such an inhumanity as the profiteering on the incarceration of others that that could continue. I made a film about Reagan who in fact contributed so desperately badly to unleashing these forces and giving them a kind of positive spin that we are still living with and trying to get away from today. So I can’t warn Americans enough about how gravely democracy is imperiled by these forces. When you see New York City under water up to its neck after the storm Sandy, I wonder if we have to wait until the water passes our mouths before we start saying, Do you think the corporations have done something to hurt the environment? It’s almost as if we are not allowed to talk about that which is directly in front of us. My films have been an effort to speak truth to power on this and implore the powerful to recognize they are imperiling the future of life on earth. America carries the hopes of the world with us and as our hopes start to dwindle and fade I think the hopes of the world dwindle and fade. I’m not naïve. I look out there and it’s not that I think something is greatly better than here, I think we might have been as good as it gets, and if we start to fade that’s a terribly heartbreaking and bleak outlook, and so my films are an effort I hope to shed light on the fear that I have of that.